Music is part of the identity of the city of Nashville, Tenn., where influences run through many genres and come from countless places. For one nationally touring Nashville band, the influences run as far afield as the SUNY Oswego campus. Dynamo, formed in 2012, consists of nine core musicians – two of whom are Nate Felty ’12 and John Murphy ’12. When they’re not performing or recording in Nashville, the band is on the road, spreading their unique brand of feel-good music to audiences all over the world – including Tyler Hall’s new soaring two-story rehearsal room on April 25. 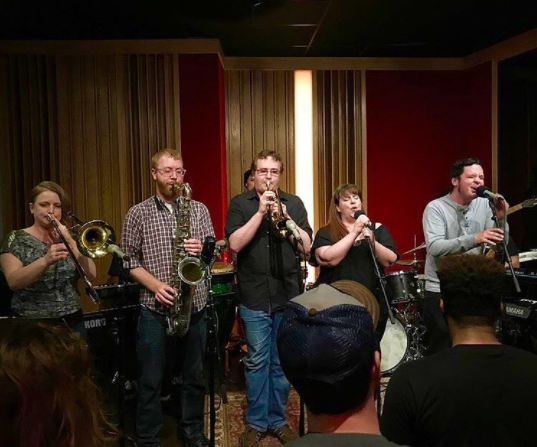 With its jazz, rock and funk sound and elements of soul and R&B, the group didn’t just visit campus, they infiltrated Associate Professor of Jazz Studies Eric Schmitz’s student jazz ensemble, giving its members a chance to go elbow-to-elbow with professionals on the same instruments. It was a stop on the band’s Celina tour, which also had them playing in Old City Hall in downtown Oswego later that night. Head-bobbing, toe-tapping and wide smiles were shared as students studied the techniques of the professionals, who gave gentle guidance after the students performed “Peculiar” by John Scofield, arranged by Mike Cramer. It is a song which embodies New Orleans funk–a genre the student band has been working on. Dynamo group members told students that New Orleans sound has a distinct feature: it’s in no hurry to get anywhere. They also encouraged students to see the music as an “open conversation” – supporting and reacting to the other musicians’ ideas as it progresses. Dynamo members seated themselves among students who play the same instruments they do: From saxophonists to bassists, students watched fingers closely as the professionals brought their own steam to the music. According to Felty it’s not just the students, but the faculty and staff who draw him back. “Their guidance throughout my time there helped shape my career so that when it came time to graduate and move on to the next chapter, I wasn’t nervous, but excited instead,” Felty said as he listed those who were formative influences on his time at Oswego, including Schmitz; wind ensemble assistant professor Trevor Jorgensen; piano professor Rob Auler; orchestra professor Juan LaManna; voice professor and department chairman Todd Graber; and audio senior program specialist Dan Wood M’10. “The fact that I love returning to Oswego to visit and catch up with all of them even after five years is a testament to their ability and guidance as educators, mentors and friends,” Felty said. Students were also treated to a jazz composition/arranging clinic with Dynamo, and a free afternoon concert was held for students and staff in Tyler Hall. “Hearing and seeing a great professional band like Dynamo that includes recent Oswego graduates sends a very clear message to our current students: This could be you in a few years — playing the music you love with great friends, making outstanding CDs, touring nationally and pursuing a successful and satisfying career in music,” Schmitz said. 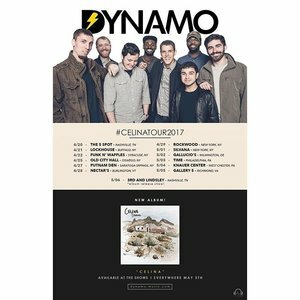 To hear Dynamo, purchase a CD or find a date on the group’s tour, visit www.dynamo-music.com.